I started experimenting with a new navigation menu I found. I’d like to convert to new, more dynamic navigation to better enable users to get to the floor they want in the part of the mansion they want (I’d create separate pages for each floor of the East and West Wings. Here is my experiment page, not quite laid out right. The code to do this would be a pain to add to every page, so I’m looking for something that I might be able to do in a streamlined way (with a couple of carefully-constructed find-and-replace functions). However, it’s interesting to see the general look of it at least. The photos were provided (like most of the contemporary photos and layout of the West Wing) by Pete Sharkey from a White House video of some sort. Thanks Pete! I did a little digging on the Truman Library site for second floor Residence bathrooms and discovered a couple of good images that I added. I also discovered that I had the tub picture in the wrong room, but they’re very, very similar. Changes affect the Kitchen, East Bedroom, Master Dressing Room, and Living Room Bath. Added half a dozen more pictures from those sent by Pete Sharkey, including LBJ in the Cabinet Room, listening to heart-wrenching tapes from his son-in-law in Vietnam; Hillary redecorating the Blue Room; Mamie in a storage room and the laundry in the basement; and the White House draped in black crepe (for, I think, Harding; Pete thinks Lincoln); and the mysterious Secret Service Office (or, at least, the “lounge” part of it) on the West Wing ground floor. Update: The black crepe was for Garfield. Went thru CS Anthony’s The Kennedy White House and pulled some pictures of the second floor. This helped catch a mistake in the children’s bedrooms (Jr & Caroline) and clarify the sad story in West’s book about the room that is today the Beauty Salon a.k.a. Cosmetology Room. Also got a great pic of the president’s bedroom, the Kennedy elevator (at last, in color! ), and the West Sitting Hall, which I didn’t even realize I didn’t have from the Kennedy era. 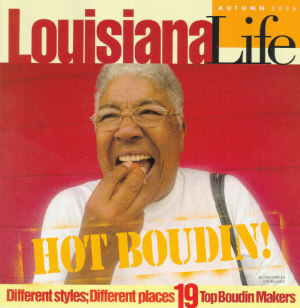 John A sent this pic from the Autumn cover of Louisiana Life featuring “Hot Boudin!”–a spicy Cajun sausage. We’re sure that Jackie Kennedy would have got a laugh at the expense of Stephane Boudin, the French interior designer who helped her remake the White House. Changed the front page image again, this time to an 1893 image of the north entrance with the Tiffany window, a rather stately welcome, I think. I guess I’ll make a point of changing the front page image once a month, since I’m sure I have good images to support it. I wish I had more seasonal images, tho.